Do you have as much trouble keeping track of pencils as I do? Does it seem like you are CONSTANTLY refilling the pencil bin each day, only to have no pencils left at the end of the day? Well, fret no more! 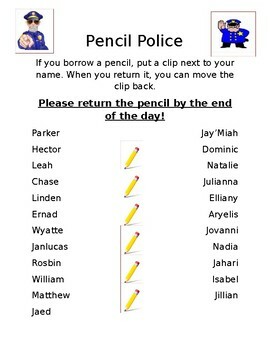 Assign a student or two the job of being the pencil police! A student takes a pencil from the bin, moves their clip down, at the end of the day the pencil police collects back the pencils and moves the clip back up. If the student cannot return the pencil because it is lost or broken, the pencil police charges them a fine of 5 BEE's ( which is our behavior management token). Trust me they will not lose these pencils anymore. The pencil police also sharpen the pencils and replace them when they need to be replaced!